Blaq Lghtn Strikes..Again and Again (and Again): Quantum Jazz Music Suites is out! 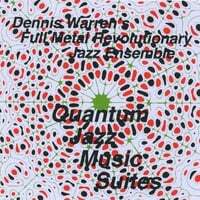 Quantum Jazz Music Suites is out! In fact, we (Full Metal Revolutionary Jazz Ensemble) had the cd release concert a couple of weeks ago and it was incredible. I just received my copies of the recording from that and it's quite superb! So I felt it was my duty to inform you that you can buy a copy of Quantum Jazz Music Suites by visiting fmrje.com.